These cookies!! They are amazing, to shorten it for you. If you were to ask me for a list of my favorite cookies, these cookies would make the list. They have white chocolate, butterscotch, and oatmeal in them. What makes them even better? They are made with BROWN BUTTER. Yep, good, just got better. Oh yeah, I don`t mean to sound demanding, but make these cookies! One of my ex-roommates was trying to be vegan awhile back, but when she smelled these cookies, she couldn`t resist and ate one. Later, I found out she ate wayyyy more than just 1. I felt so bad I tempted her with these...but as they say...sorry, I`m not sorry. These cookies are meant to be shared! LOL. 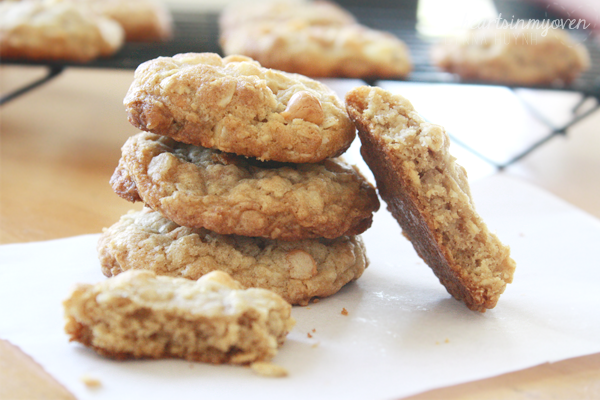 This recipe is also one of those cookie recipes I keep remaking over and over. 1. Line baking sheet with parchment paper or baking mat. 3. Brown the butter: Over medium heat, in a small saucepan, melt the sliced butter. 4. Once butter is almost melted, whisk the butter constantly. It will crackle and bubble, but keep whisking. 5. Once the butter begins to brown, remove from heat. Transfer to a bowl and set aside to cool slightly. 6. In medium bowl, whisk together flour, baking soda, salt, and cinnamon. 7. In a large bowl with an electric mixer, beat together the brown butter, sugar, brown sugar, eggs, and vanilla. 8. Add the dry ingredients (flour, salt, etc) to the wet ingredients (butter, sugars, etc) and mix until just combined. 9. 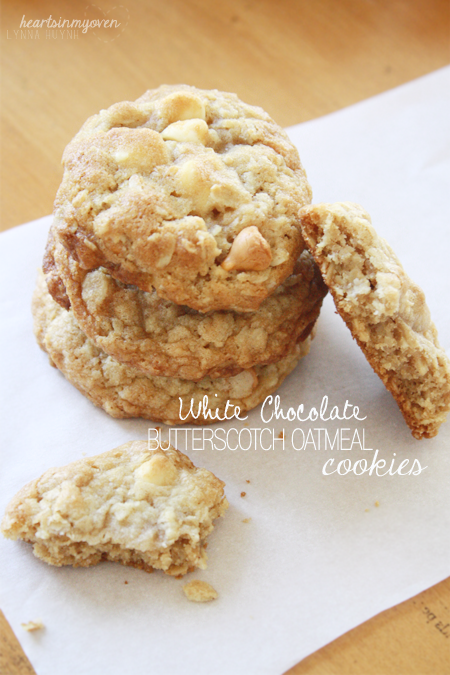 Using your rubber spatula, fold in the oats, butterscotch, and white chocolate chips. 10. Using a cookie scoop, scoop dough onto prepared baking sheet. 11. Bake for about 9-11 minutes, or until edges or golden brown. 12. Cool on cooling rack. Cookie batter is more liquidly than most cookie batter, but it will bake up fine. If the cookies do not turn out well on the first batch, stick batter in refrigerator or freezer for a little bit before baking.